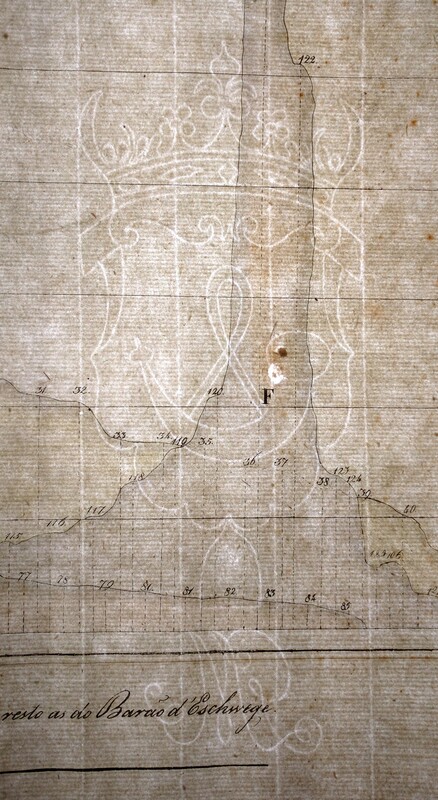 Look at an old map, from around 1800 or older, and notice the paper it’s printed on. It’s think and hefty, not thin and flimsy like the paper modern road maps are printed on. The paper has a slightly toothy texture rather than perfectly smooth. Hold it to the light and look for crisscrossing lines and watermarks. These are the signature traits of old paper. Paper is made of cellulose, plant fiber, in a slurry, that’s dried in thin sheets. Before the mid 1800s, the source of the cellulose was linen and cotton, pulverized with water to make pulp. The pulp was spread on wire mesh, pressed and dried. Later on, wood pulp paper became the norm. Cellulose is a material made by plants for use in their structures, consisting of individual glucose molecules bound together with special chemical bonds making them very strong. Short by our scale, far too small to be seen by the eye, but large on the molecular scale, these strings weave together in the pulp to form a mat. Rag and wood pulp papers differ in that the cellulose strings in rag pulp are between three and ten times the length of those in wood pulp paper; rag papers’ fibers are far more interlaced than those of wood pulp papers, making a stronger and more flexible sheet. But that’s not the only difference: the cellulose in wood comes packaged with other materials, occluding lignins and sulfur based compounds, contributing to the faster breakdown of the paper. The wire mesh used in laid paper manufacture left a telltale crisscross pattern. Termed chain lines and laid lines, these are the fingerprint of the deckle, or frame, on which the paper was laid. Sometimes a wire design was stitched into the deckle to yield a watermark, where the raised wire would result in a thinner area, appearing lighter on the finished product. Machine made paper may have watermarks as well, and the crisscross pattern, while not an inherent artifact of the process, may be mimicked. Map collectors, myself included, usually devote our attention to subject of the subjects of maps without noticing the paper they are printed on. This is too bad. These old papers are marvelous works of art and science in their own right.